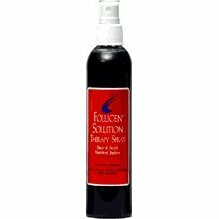 Folligen Solution Therapy Spray which can be sprayed as a fine mist into the hair and is designed to improve scalp and hair follicle health and hair vitality. 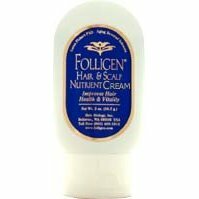 Folligen is especially useful in helping to reduce scalp irritation caused by other hair growth products such as Rogaine (Minoxidil), Retin-A (Retinoic Acid) and Propecia. Folligen Solution Therapy Spray uses small amounts of polysorbate 20 and propylene glycol to enhance the uptake of copper-peptide around the hair follicle.